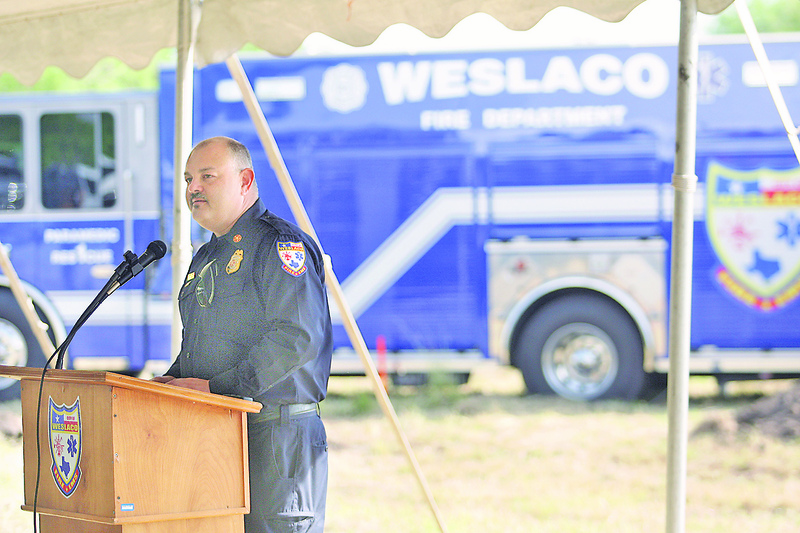 WESLACO — City leaders and first responders from across Hidalgo County gathered here on the north side of town to break ground Thursday on what will become a state-of-the-art fire and EMS station. The $1.38 million future facility, located on Mile 11 North Road, just east of Farm-to-Market Road 88, is expected to open its doors in time for the city’s centennial. Lopez called Thursday’s groundbreaking a “monumental achievement” and a collaboration between all the city’s departments. The 10,500-square-foot facility will sit on three acres of land — part of a total of 48 acres purchased by the city less than two years ago. It will feature three 100-foot long “drive through” bays capable of holding the department’s fire engines, as well as two 65-foot bays for ambulances, Lopez said. “We’re very excited and we’re glad it’s coming to fruition,” Weslaco Mayor David Suarez said after the ceremony. “We’ve been working on this a couple of years as we looked at our CIP plan, our five-year plan, with the city manager and the commission,” he said, referring to Weslaco’s capital improvement plan. The mayor added that city leaders chose the site intentionally to expand its extraterritorial jurisdiction, or ETJ. City Manager Mike Perez explained the city has been saving money over the last several years in order to fund the completion of projects identified in the capital improvement plan. “We were able to bring it within our budget,” Perez said of the so-called north side fire station. “City staff is doing a lot of the work, and then we hired a contractor to build the building,” he said. Weslaco-based Tri-Gen Construction will build the facility. According to the company’s website, the general contractor firm has worked on a number of commercial and residential projects, including for Progreso ISD, Texas State Technical College and Stores at Palms Crossing. Eli Alvarado, of Alvarado Architects and Associates, is the project architect. City leaders said the dual fire/EMS station will allow first responders to better serve not just Weslaco residents, but the entire Mid-Valley. “This is so vital; this is so important to this area. It’s going to increase those services,” said District 3 Weslaco City Commissioner Jose “J.P.” Rodriguez. Fellow commissioner Letty Lopez, District 5, echoed those sentiments. “Today, as I was driving over here, I was taking the scenic route and driving through a lot of rural area — fields — and just opened my eyes as to what this fire station is going to do for our city of Weslaco, to the safety of our citizens but also the development of our city; the continuing of Weslaco, which is a city on the grow,” Lopez said. Rodriguez added that the facility will help city leaders fulfill their obligation to meet the city’s increasing public safety needs. “As the city grows — as there’s economic growth and there’s residential growth — we recognize that we also have to keep up with our public safety growth,” Rodriguez said. But, it’s not just the fire station city leaders are excited about. Plans are in the works to create a multiuse park adjacent to the fire station. It will include baseball and soccer fields, an amphitheater, a splash pad, a walking trail and outdoor exercise stations, Suarez said. “It’s real exciting, I think, for the community and for the fire department, and for the organization,” Perez said.